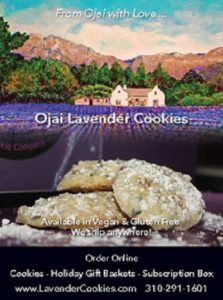 Ojai Lavender Cookie Company, is an artisan local cookie company specializing in gourmet lavender cookies using 100% organic ingredients. Our lavender is organic and from local Ojai lavender farms. Our unique Victorian Lavender Cookie is a 100-year old recipe from England, and was a favorite among the royals. Topped with Rose Icing, it is pleasurable to all your senses. In fact, lavender is known to be uplifting and raises your spirits. We like to think of it as a joyful flower that embodies everything good about childhood, like fairies and fairy tales. Try it paired with lemon tea. Ojai Lavender Cookies are available in Lavender Gluten-Free and Vegan Cookies as well.